Like I said you don’t need to be an artist if you don’t want to be! I’m no expert but this is the way I do it. 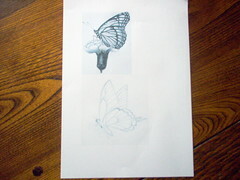 For your picture…draw one if you are artistic…If you aren’t, no prob get out a children’s colouring book or just find a picture that you like and trace over it so that you don’t ruin the original picture. (I use grease-proof paper from the kitchen because it’s easy to see through.) If you can copy it on your printer that may make it easier for you. 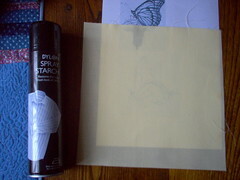 Wash the piece of fabric that you are going to use for your picture, dry and starch it. The starch is going to help it keep it’s shape whilst you sew. You can wash it out later when your picture is complete. 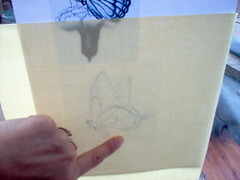 Now you need to put your fabric over the picture to trace the picture though, using the water-soluble pen. 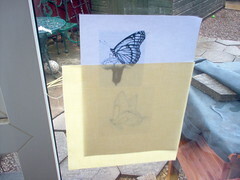 You could use a light box if you have one…I don’t, everything gets taped to the window here! 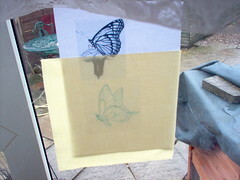 There are various ways to transfer pictures to fabric. This is the way I do it. You could google it if you wanted. 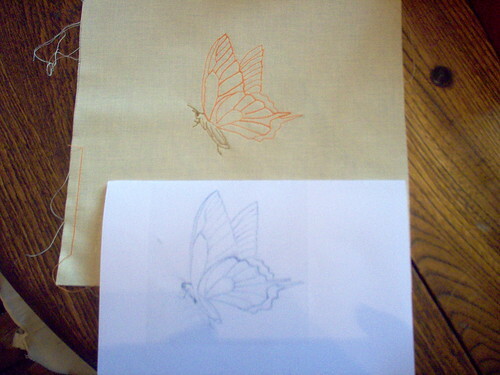 With a transfer on fabric, You can sew this two ways. 1. Drop the feed dogs on the machine and use free-motion sewing. 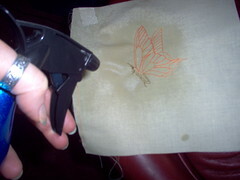 If you aren’t used to this type of sewing (it can take a little practice) you could do it this way instead. 2. Leave the feed dogs as they are. 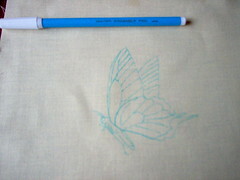 Put the stitch length to very short. Use a foot so that you will be able to see the front, where you are about to sew. At this point I make a cuppa, you want to be relaxed when you sew these pictures or you will have jerky lines, lumps and bumps. Ok? 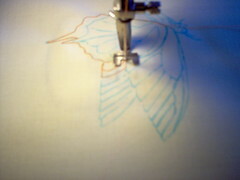 Let’s sew. There really isn’t much to it. Follow the lines. Try not to break the thread off at the end of a line. If you do, tie it off underneath straight away to keep the underneath free. 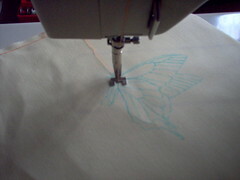 sew over other lines to get to other pieces that you want to sew. Use straight stitch, zig-zag whatever you fancy. Just have fun and create! You could do this on clothes too and give them a new look, drawstring bags for the kids, little zipped make up bags, even patches over holes! Anything at all really, the list is endless…let your mind go! Most important HAVE FUN! 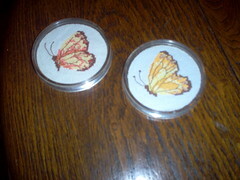 Just for the sake of pretty butterflies, here are the coasters that I made some time ago that live on our coffee table. Great tutorial,Most informative. 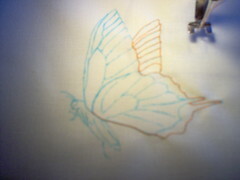 what will you make with the amazing butterfly? Thanks! I always wonder if I explain things properly or if i’m just waffling! It’s going to be a little coin bag for those days when I don’t want to carry a huge purse or even a bag for that matter. Like going to the park when you just put in enough change for an ice cream or something. I was going to make the bag up but I didn’t have the right zip, have to wait til tomorrow now coz the market’s closed today. Lovely work. A really clear tutorial too. Thanks for sharing this project.